We use our storytelling talents and distribution know-how for our companies and our clients. Our job is to get the right story in front of the right audience. I’ve learned that SEO wins happen at the intersection of identifying storytelling opportunities and maximizing the visibility of those stories through search. And yet I think it can be easy for an SEO to forget a critical role they play for clients and for organizations: that of the content evangelist. SEOs can fall into a trap of focusing on the technical requirements for making content findable by search engines. 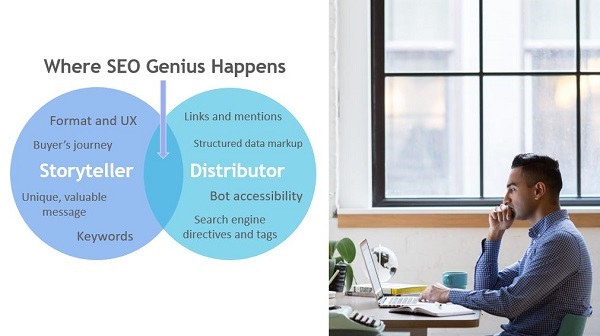 And while crawlability and accessibility issues are key SEO responsibilities, big brands today are demonstrating that the competitive advantage lies in crafting 10x content and investing in SEO content strategy. Here’s an infographic you’ve probably seen before. 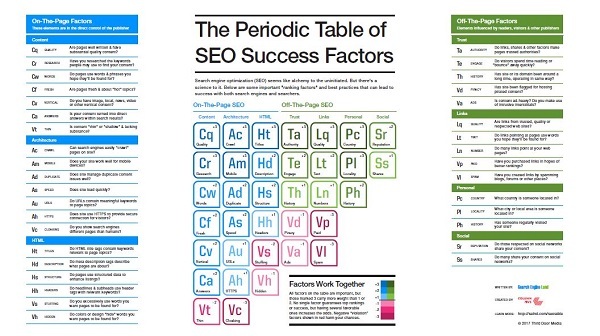 It’s Search Engine Land’s Periodic Table of SEO Success Factors. It does a really good job of hitting on every component of an SEO’s domain. Click to visit SearchEngineLand.com where you can download the Periodic Table of SEO Success Factors. It’s neatly divided into on-page and off-page factors. Of course, nothing in real life is ever so neat. There’s always overlap and grey. There are no links without content. But if we accept this diagram at face value, we can still interpret a lot about an SEO’s top priorities. For instance, look at the on-page factors. You’ll see content and you’ll see technical SEO. We know that Google has said that the two most important ranking signals are content and links. From that we can infer that technical SEO does not provide as big of a competitive advantage. Technical SEO is more like the barrier to entry for ranking. Is your site crawlable, is all the HTML in the right place, are duplicate pages consolidated with canonicals and parameters excluded in Search Console? These technical SEO issues are critical to search visibility. Still, I’d argue they represent the lowest common denominator. You’re rarely going to climb to the first page or the top 3 rankings on the basis of clean, crawlable code. Not having these things will hurt you, but having them won’t give you a competitive edge. 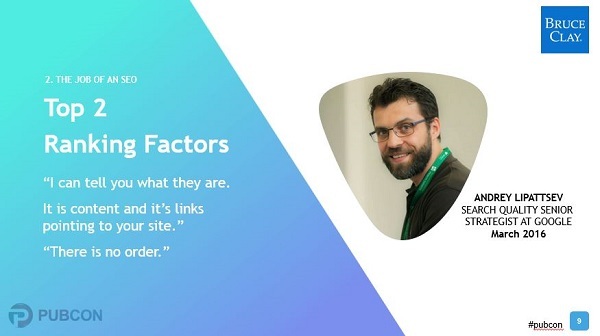 Remember what Google said — the most important ranking factors are links and content. And if you have to prioritize one of those things, it has to be content, because content is what generates links. Here are concrete ways that you can empower your role in SEO by evangelizing content to your company or your clients. 1. Content is in your control. When it comes to generating links and content, don’t put the cart before the horse. As long as you’re not buying links (and you’d better not), you’re going to need link-worthy content on your site that attracts links. Who links to you is an X factor. It’s not as squarely in your control. What is in your control? Content. Who links to you is an X factor not in your control. What is in your control? #Content. 2. 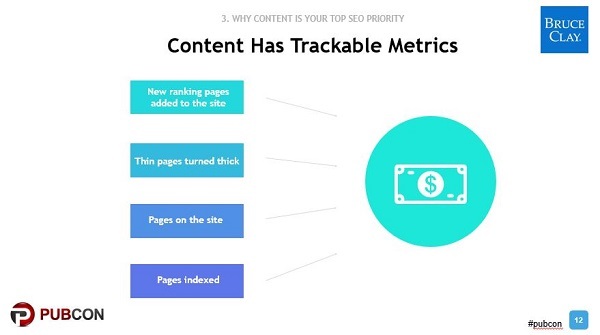 Content has trackable metrics. What gets measured gets done. While bottom-line KPIs are traffic and conversions, those results are the outcome of the effort you put in to make your site an authority with a satisfactory user experience. The number of thin pages that you make better. The number of new ranking pages you add to the site. The number of pages on the site and pages indexed. What’s awesome about focusing SEO campaigns on content is that you can truly track your progress while you’re creating more great content. 3. Bigger sites make more money. When your boss asks you, “What’s the ROI of this content initiative?” you can say that big sites make more money. When Jeff Bezos bought the Washington Post in 2013, he brought a new growth strategy to the paper. 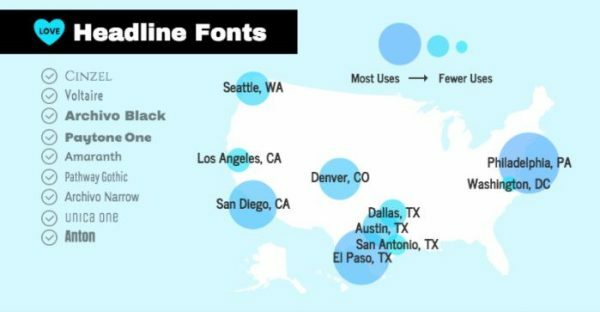 WaPo grew WaPo traffic 28% from 2015 to 2016. 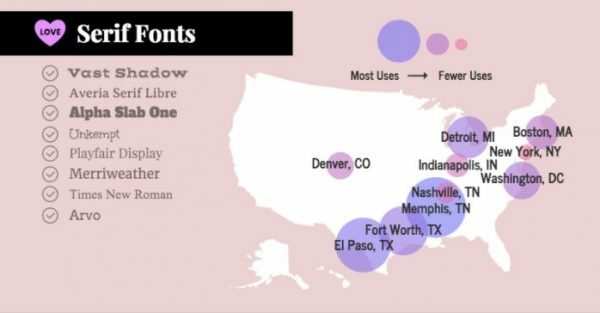 The effort resulted in WaPo surpassing The New York Times’s traffic in 2015. How did they do it? By adopting a content strategy around producing a high volume of content aimed at long-tail and niche interests. How can a small website compete with a larger one? Who are the major competitors in your space? How many pages do they have on a topic? More pages mean more opportunities to rank. More pages demonstrate depth of expertise, making you more likely to rank on a topic. Just like a company needs to grow to make a profit, so does a website. That is certainly a worthy goal. But the truth is that good, quality content isn’t good enough. Today’s bar for Page 1 rankings is 10x content. The skyscraper technique popularized by Brian Dean is the process of looking at the top result for a query you’re targeting and then outdoing that top-ranking page with your own page. Dean calls this content marketing for link builders. See what ranks the best and then shoot even higher with your own answer to the query. Sounds like a lot of work, right? It is. Of course, smart SEO minds have refined the process. Research the pages that are ranking. Use Google to see the top-ranked pages and use BuzzSumo to see the most shared content on a topic. What are the questions that are asked and answered in these pages? How thorough is the information? What’s missing? HubSpot shared word-count analysis of its blog posts compared to organic traffic and found that a word count of 2,250–2,500 words gets the most traffic. So you definitely want content to be thorough and comprehensive. What’s the format and delivery mechanism of these pages? You might also call this the user experience. Is it visual? Is it video? Is it rendered well for the device? Is the info I’m looking for on the page, or do you have to click to another page? Is it easy to find an answer? What are the sources of the information and are they credible? What’s the quality of the writing? Once you collect all these answers and identify what search engines are rewarding and what people are sharing, you’ll know what you at least have to do to compete. And you can figure out how to better it. Here’s the sucky thing. Generating 10x content requires sweat and grind. But there are some likely sources of 10x content magic that you can mine. Data-driven content: This is the Pricenomics model. Pricenomics is a content agency that turns company data into content and then tracks the distribution and performance of the content. There’s story in data and people just eat that stuff up. Expert voice content: This is just journalism 101. You go to the expert source and you name your sources. Honestly, if you can find a good expert, maybe someone on your staff or maybe the biggest name in your industry, and they agree to an interview, this is one of the fastest ways to 10x your content. You get that credibility factor. You get the network effect of the expert and their followers sharing and reading. What you want to steer clear of here is the trap of the expert round-up. I think we’ve all seen that. And those aren’t all bad, but they are kind of cheap. We’re not going for cheap. What you’re looking for in talking to your expert is to raise your page to the next level. Bring something to the forefront that the normal person misses, but that will create that light-bulb moment in those reading it for the first time. Start your practice of nurturing relationships with experts with this Bruce Clay guide. 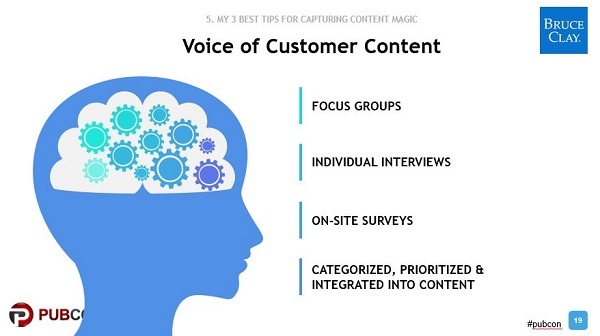 Voice of Customer content: Writers start by thinking about their audience. You get into the target audience’s head to find out what they want, what they need, what they know, what they don’t know they need. And then you write to solve a problem in that audience’s – or persona’s – life. In marketing, we’re matching the pain point with our solution. And what really resonates with your target audience is hearing or reading the thoughts that are actually going on in their head, or close to it. There are many possible ways to gather the information used to synthesize VOC: focus groups, individual interviews, and contextual inquiries (like on-site surveys) are a few. But you’re basically using structured in-depth interviews, focusing on the customers’ experiences with current products or services. Need statements are extracted, organized into useful categories, and then prioritized and used by the business all the way from product development to marketing. I learned about the methodology around Voice of Customer data from Copy Hackers. User-generated content, product reviews and testimonials are essentially forms of VOC content. And maybe this is where the altruist in me comes out, because when we turn our focus on SEO content, we’re doing something special. We’re not trying to find a loophole to exploit and win on a technicality. We’re sharing stories that will enrich people’s experience. We’re teaching people about solutions that will make their lives better. And we’re making connections with people like us. SEO has to encompass those 30-or-so factors on the Periodic Table of SEO Success Factors. But the forensic-style technical SEO is not the bar you’re holding your work up to — it’s the minimum viable SEO. Today, getting the technical stuff right is just the ticket to entry. If you’re actually trying to reach the top, you’re going to prioritize content as the top SEO issue for you to solve. If you like this post, please share it with your friends or colleagues. For more like this, be sure to subscribe to our blog. This post is based on my presentation “Thin Content Is THE Top SEO Issue” which I shared at Pubcon Las Vegas last week. Check out the full deck below. Google loves high quality unique content to achieve top search engine ranking. I am so inspired to read these wonderful tips. I am always passionate to learn about innovative things about internet marketing and your post is one of them. I also bookmarked this page to stay connected with your further useful posts. This information is very helpful, gives a complete idea how important content is for SEO. Now I do agree that Content is king in SEO. Your Post is too much informative and it contains everything regarding SEO, Thank you so much it will help beginners. Snoopy: Marketing results take a lot of trial and error, don’t they? No technique works in every situation … but maybe that’s a good thing! I already used the skyscraper technique but I must say, it did not brought as much traffic as promised. But maybe I didn´t do enough for this. Who knows. Yes, Content plays a big role in SEO. Thanks for sharing this useful information, also do you know which is the best tool that can help us to enhance the content quality of web pages? Salan: 2500 words, wow! You no doubt found a meaty topic that appealed to your audience, in addition to putting in the effort required for a mega post. Thanks for sharing your experience. Content had been my top priority in 2017 and its going to be same for 2018. The articles that have really shined are the ones with 2500+ words. Thanks for this article. Really helpful. James: Thanks for reading. For an SEO guide, a good resource is our SEO Tutorial (https://www.bruceclay.com/seo/search-engine-optimization.htm). It has 18 lessons on the different aspects of SEO. Hope it helps you! Seo is much more to learn today really good to see this about SEO blog here on. Thanks for This awesome post to author make me more knowledgeable. Have you any guide more about SEO? Let me know that. I always focus on optimization. I think this is the most important for a successful site! This is a strategy that will have a great impact and will give much efficient SEO results. Thanks for sharing it early! SEO Content is important. it is always good to prioritize that over link building and other factors that help in rankings. Today, SEO isn’t just for con men anymore. Respectable businesses are learning how to optimize their websites so they can be found by people who are searching for the products and services they want to sell. This means, of course, that they don’t just want visitors to drop by once. They hope to keep them coming back. This is why content is so important. Webmasters and SEO experts have a saying: “Content is King.” It’s very true. A website’s content, even more so than its products, is what attracts visitors. If you can’t write good content yourself, TechKnowSys can help you by providing an author who can write SEO-optimized for your industry. I agree with the article. The content has to be either fresh or told from your experience. Google hates content that is plagiarized.Also the article has to be written in seo format. The more content the better. I always prioritise SEO content, this is one of the biggest factors when it comes to search engine optimisation. That’s a totally worthwhile strategy decision in my mind. Thanks for the comment, Gary! Yes! I do agree because these days people love content then google also. If you want to rank higher then include the content and it works. It should be well structured, more headings, images, social posts, and more.